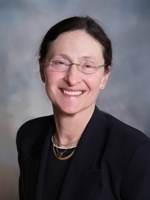 UNMC › Pathology and Microbiology › Faculty › Bios › Phyllis I. Warkentin, M.D. My research in Transfusion Therapy is mainly in the management of ABO incompatibility in hematopoietic stem cell transplantation, both the transfusion management and the manipulation of the incompatible graft prior to infusion. In my laboratory, we have developed and validated methods of red cell and/or plasma depletion from marrow or peripheral blood stem cell grafts. We have also completed participation in a long term trial of T-cell depletion the allogeneic stem cell transplant recipient with an unrelated donor. We now also perform pre-cryopreservation CD34 positive cell selection from autologous grafts. Clinically, I have been interested in the role of the preparative high dose chemotherapy/radiotherapy regimen in the survival and quality of life of blood and marrow transplant recipients. I have collaborated with other pediatric oncologists in the investigation of alternatives to traditional cyclophosphamide and total body irradiation for the treatment of acute leukemia and of the role of ThioTEPA in the therapy of solid tumors. We have collaborated in a national trial of total lymphoid irradiation for aplastic anemia. Recently, we have published our unique experience of complete hematopoietic and immunologic reconstitution without a preparative regiment in a child with severe combined immune deficiency. As Chairman of the Accreditation Program of FACT, I have been very involved in the development of standards and of the inspection and accreditation of stem cell transplantation programs world-wide. We have accredited 66 transplant programs, and have recently published the first edition of Standards for Cord Blood Banking. Our blood and marrow transplantation program at the University of Nebraska Medical Center achieved FACT accreditation in early 2001. Rubocki, R.J., Parsa, J.R., Hershfield, M.S., Sanger, W.G., Pirruccello, S.J., Santisteban, I., Gordon, B.G., Strandjord, S.E., Warkentin, P.I., Coccia, P.F. : Full hematopoietic engraftment after allogeneic bone marrow transplantation without cytoreduction in a child with severe combined immunodeficiency. Blood 97: 809-811, 2001. Kobrinsky, N.L., Sposto, R., Shah, N.R., Anderson, J.R., DeLaat, C., Morse, M., Warkentin, P., Gilchrist, G.S., Cohen, M.D., Shina, D., Meadows, A.T.: Dexamethasone, Etoposide, Cisplatin, Ara-C and L-Asparaginase (DECAL) Treatment for Recurrent Non-Hodgkin's Lymphoma and Hodgkins Disease: Children's Cancer Group Study CCG-5912. In press, Journal of Clinical Oncology, 2001. Joshi, S.S., Miller, K., Jackson, J.D., Warkentin, P., Kessinger A.: Immunological properties of mononuclear cells from blood stem cell harvests following mobilization with erythropoietin + G-CSF in cancer patients. Cytotherapy 2:15-24, 2000. Warkentin, P.I., Nick, L., Shpall, E.J. : FAHCT Accreditation: Common Deficiencies Observed at the On-site Inspection. Cytotherapy 2:213-220, 2000. Letheby, B.A., Jackson, J.D., Warkentin, P.I. : Cryopreservation Techniques. In: Buchsel, P.C. and Kapustay, P.M., eds. Stem Cell Transplantation: A Clinical Textbook. Pittsburgh, PA: Oncology Nursing Press, Inc., Chapter 4, pp. 4.1-4.20, 2000.